This stack of photos, only a fraction of the dozens in the collection, depict an interesting display. Back when Porsche introduced the 959 in the mid-1980s, they toured the car around to various auto shows around the country. There wasn't an internet back then, so other than motoring magazines, your only chance to see the 959 was to go to the auto shows. 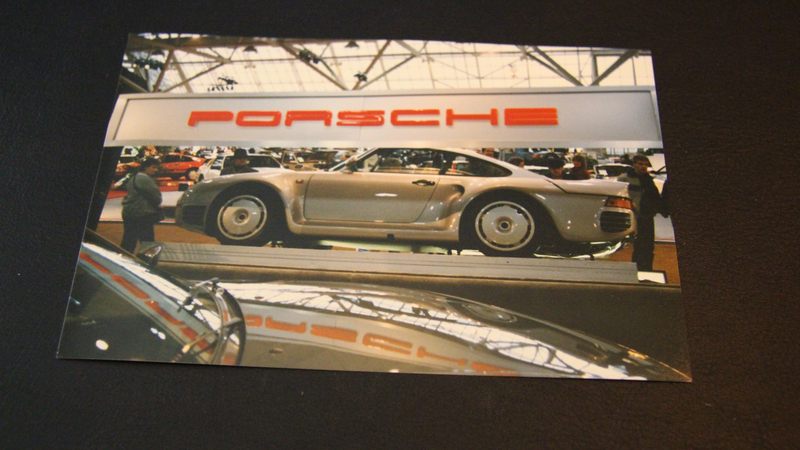 Porsche's 959 never did end up coming to the US as a production model, so the fact that this cutaway car was on their display stand is a curiosity in and of itself. A few years ago, a friend gave me this stack of old photos as a wedding gift. He's a good friend and he knows me well. He doesn't recall the exact circumstances of how he came into ownership of the photos, but he told me that these were probably taken at the Cleveland Auto Show around 1986. The photos don't look like the I-X center to me, but I don't see anything to determine otherwise. If you know where these were taken, put it in the comments below. Of the dozens of photos, this is the grouping that is most interesting. Many of the others are simply out of focus, or double exposed. A handful of these photos had a sticker on them denoting a picture so bad that the photo processing center felt they shouldn't charge for it. Photo technology has come a long way since the 1980s, too. The center point of their display, it's obvious that Porsche was proud of the technology that had gone into the 959. Here is one of the free-of-charge photographs, but I thought the effect was just too cool to not share. From the back, you can see the angle from which the cutaway was taken. You can see the complete engine on display, while the roof, bodywork, and spoiler are cutaway. Some of the fit and finish have been disrupted without the proper mounting points, but it's a very cool piece of Porsche history. Porsche, thou hast cleft my 959 in twain. With the right-hand side of the car gone, you can see suspension pieces and the exposed drivetrain. It allows folks who are interested to learn an awful lot about a car and certainly attracts attention. These interesting aero wheel covers are pre-production, giving way to the standard five-spoke that you know and love. Underneath is a hollow 5-spoke design, but it isn't quite the same as what reached customers. Starting at the back where the important stuff is, you can see the turbocharged flat-six engine without its fancy wrapping. It somehow doesn't look as impressive uncovered like this. Still quite cool, though. In this shot you can also see the rear hydraulically adjustable suspension, identifying this as a 'Komfort' model. Here you have the triple-K turbocharger and a massive meaty intercooler sitting directly behind the rear wheel. This is also a nice shot of the stainless exhaust system, on full display. The foam-core rear aero looks quite interesting. I guess I'd never thought about what the inside of a 959 wing looks like, but now I know. The right hand side rear wheel has been cut apart. This displays both the wheel's lightweight hollow spokes, as well as the unique bead-locking Bridgestone RE71 "Denloc" tires. This maroon-leather tri-color interior is very indicative of the era in which these cars were built. The interior of a 959 did not age particularly well. From this shot, however, you can see the transaxle at the back and the torque tube running to the front wheels for Porsche's innovative motorsport-derived all-wheel drive system. How about that, a 959 dash looks pretty damn similar to any other 911 of the era. Here is a detailed shot of the front wheel and associated gubbins. The thing that struck me here is the use of a rubber-bushed tie-rod instead of a ball-jointed tie-rod as the 911 Turbos of the era featured. Perhaps Porsche wanted more of a comfortably damped steering feel rather than a sharp and communicative one? This exact car still resides in the Porsche museum, though at some point they crafted fillers for the holes in the wheel to make the tire sit more flat, and have refinished the outside edge of the rear wing in matching silver paint. It's possible this show stand model may have been given a light restoration at some point.